The beginning of a project often begins with a disaster. The owner of this Nissan 370Z was previously into Mitsubishi EVO’s having a nice example of an EVO IX. The EVO was totaled in an unfortunate rear ender leaving our owner with a chance to pursue a new dream with a brand new car. Finding a reasonably priced vehicle to replace a highly capable EVO IX was a tall order but a suitable replacement was easily found in the Nissan camp. 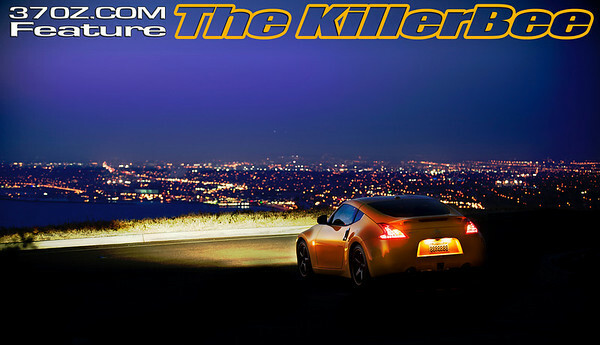 The new ride was a brand new Nissan 370Z Sports Package in bright chicane yellow. The sports package is an excellent launching pad for a project car with a six speed syncro-rev equipped manual transmission, big 14/13.8" brakes, spoilers and a viscous limited slip differential. With the 370Z’s aftermarket in its early stages, the car is just starting its journey down the highway to ultra high performance but currently the car is an example of what an early adopter can do with the Z34 platform at this stage in the game. A Jim Wolf Technology Dual Pop Charger air intake system was installed as a first mod. The JWT intake gave a glorious intake roar and provided a couple of extra hp. During dyno testing the Killer Bee exhibited the issue that seems to be the Achilles heel of the 370Z, high oil temperatures. After just a few pulls on the dyno, the oil temperatures soared into the 260 degree range. 260 degree temps were also recorded in normal street driving in bumper to bumper traffic. To alleviate this, a Technosquare oil cooler kit was installed. Since then the oil temp has not exceeded 250 degrees. To help improve breathing, a Stillen all stainless, true dual exhaust system was installed along with some Stillen high flow cats. This resulted in an impressive gain in power along with a nice exhaust note. Once the bolt on engine mods were completed Technosquare reflashed the ECU with a their performance engine tune which complemented all of the other parts installed in the car. The 370Z really responded to the mods to the tune of over 300 WHP. The acceleration is instant with the car capable of easily spinning the tires even in second gear. The engine note is amazing, sound like an exotic Italian instead of practical Japanese. To complement the engine mods, a set of matt black Axis Super Hiro wheels in a staggered fitment of 19x9.5 in the rear and 19x8.5 in the front we selected to complement the 370Z's striking yellow bodywork nicely. For the interior a B&M quickthrow shifter speeds gear changes. In the future, suspension modifications are in order as they are developed for the new Z, hopefully a set of adjustable coilovers and antiswaybars will be procured as choices come to market. More engine mods are planned as they become available and a Jim Wolf Technology lightweight flywheel and heavy duty clutch are next in line for installation. We will follow up with the Killer Bee from time to time and report on its progress. Discuss The KillerBee on our forum HERE!